There are over 70 milkweed species native to the United States and Canada. The diverse Asclepias genus is recognizable with its bright orange blooms (that’s how the Monarchs see it, too!) and grows well in many types of landscape. Native milkweeds are perennial and typically flower between late spring and the end of summer. In the picture below, you’ll see the “stigmatic slit”, through which a Monarch butterfly’s tiny feet enter. 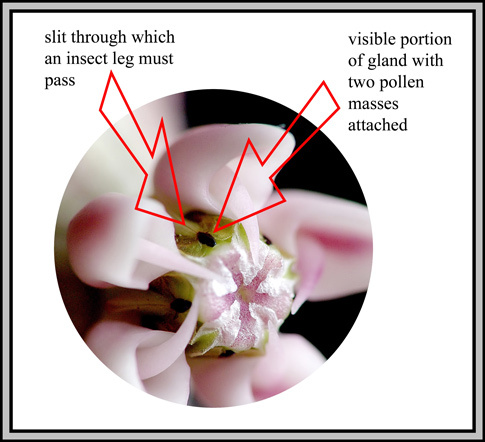 They are lodged in the slit just long enough to collect pairs of small, waxy sacs filled with pollen (called pollinia), which they release to the next milkweed on their journey (pollination at work!). In exchange for this generous deed, the milkweed rewards insect visitors with readily-available nectar found in its floral hoods. Watch this informational video by the University of Minnesota about how milkweed acts as an important source for pollinators like butterflies and bees. Any insect tiny enough can help to spread the pollinia of a milkweed, yet it is the monarch butterfly which has an especially important relationship with this plant. After the Monarchs leave their wintering ground in Mexico, they begin an epic journey north and east to find milkweed on which to lay their eggs. Once hatched, caterpillars feed on the milkweed for up to two weeks before forming chrysalises.